The 5301 breweries operating in the US have a problem. There are more good beers available today than there are good beer names. Sometimes the name emerges from the ownership naturally (Mad Fox, 3 Guys and a Beard), some brewers get really cleaver, if obscure (Pro Re Nata, the pharmacist’s term for “as needed”), and sometimes there seems to be a hint of desperation (Abandoned Building Brewery). 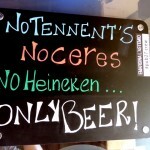 Brewers can’t get copyrights on common words (other than “Steam” apparently), so a number of common words wind up in on a great many beer taps. “Beach is one of those words, “flag” is another, but the one that has jumped out at us recently is “road” or “roads”. Two Roads, Golden Road, Down the Road, and a host of others. Curiously, many of them are either in New England or are making distinctive New England style IPAs. 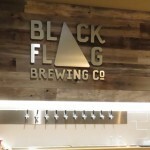 The Black Flag Brewery in Columbia managed to capture a flag name that hadn’t been used in the US (there’s a Black Flag stout in Ontario and a Black Flag brewery in Cornwall). 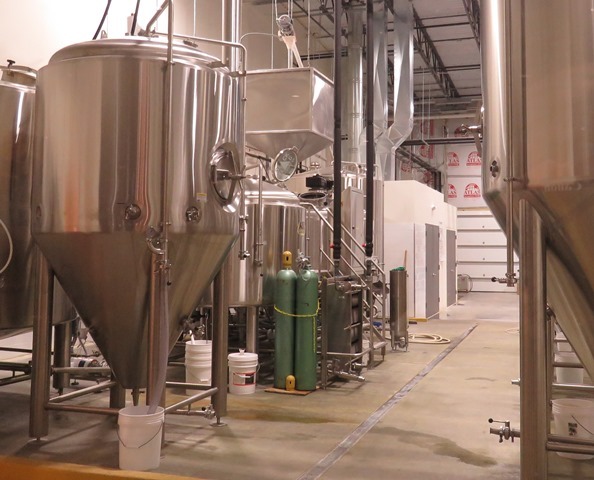 Black Flag’s gleaming stainless steel tanks are for serious brewers. Not so lucky with “Rainbow Road” though – there are Rainbow Road beers in Miami and Cincinnati, but apparently no one has gained exclusive rights. Whatever the name, Black Flag’s new England is a fine example of this still somewhat unsettled style. Almost sessionable, it’s big and juicy and dank. The flavor overwhelms before the alcohol disables. We’ve had Heddy lately and we think in a Hed to Head contest, the Rainbow might take the prize – and you don’t have to slurp it from a can. Tasting notes: Hazy gold with an amazing lace as it drinks. A very clean malt and a creamy feel softens a huge Galaxy tropical fruit and a Simcoe spicy fruit. A long bitter cries for another swallow and some pepper adds breadth in the aftertaste. Food Pairings: Spicy or full flavored dishes. A loaded burger, wings. Anything less will be overwhelmed by the hops. Ellie and I attended Hamilton College in Clinton, she when the women’s part of the school was called Kirkland College. F. X. Matt was the local beer in the late 60s and it continues to hold a special place in my heart of beers. Back then we drank enormous amounts of Utica Club and a good deal of Matt’s way-above-average Cream Ale. 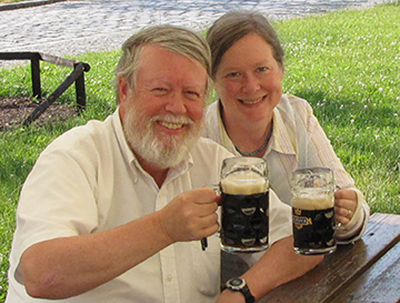 Before Ellie graduated in 1972, Matt had introduced strong cream ale called Maximus Super. 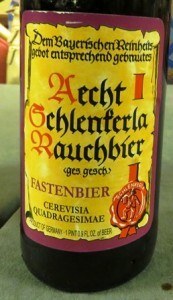 At 7.5% abv, it was the strongest beer produced in the US at the time. ; on campus it quickly acquired the moniker Maximum Stupor; I liked it because it was strong, Ellie liked it because it was sweet, but we both respected a big batch brewery effort’s to brew something distinctive. Today, the brewery that cranked out the kegs and kegs of yellow beer that powered fraternity weekends is producing over a quarter million barrels of very good craft beer under the Saranac label. 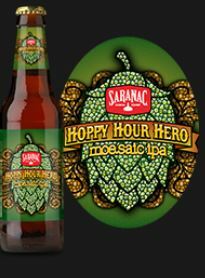 One of the best Saranac products is Hoppy Hour Hero Moe.saic IPA, a year-round regular whose 7.8% abv actually tops the Stupor’s short-lived record. This one however, has a myriad of tastes that no one would have dared tried to market in 1970. Today the fraternity houses at Hamilton that probably helped keep the brewery in business in the tough years of the 60s and 70s are gone. But we know for a fact that plenty of Saranac finds its way to the hill without their help. Tasting notes: Despite enough malt to approach the 8% mark, this is a hop show. Too clean to really qualify as dank, but it’s on the road to New England with flavors of orange, clementine zest along with a sweet malt and a hint of raw sugar. A late lasting bitter invites a return. In a way it’s an understated big kettle Heddy — and a nice job of it at that. We first encountered this beer in Bukowski’s Bar in the Back Bay area of Boston. It’s one of the best beer bars in the city– and our favorite– and we almost never miss it when we’re there. The staff can be “it’s part of the shtick” gruff, but they take good care of you and are generally quite knowledgeable about the beers which are largely drawn from local breweries. It was a surprise when they couldn’t tell us much about this beer – even where it came from. The taste spoke for itself—it was fresh and resiny and dank. Must be another New England hop bomb from nearby. Wrong. When we found a can of it a few days later we were surprised to see that it came not only from the West Coast, but from the former beer dessert of Los Angeles. The bar called it a DIPA, though the brewery simply calls it an IPA. It’s certainly on the high end of an IPA, but the border between an IPA and a DIPA is a pretty porous one. 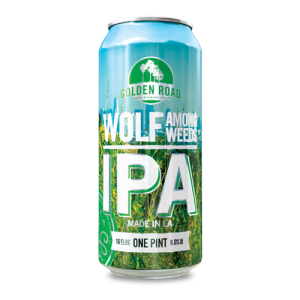 Columbus, Chinook and CTZ hops give it plenty of fruit but it manages a broad enough range of hop flavors to stay moreish until the 8% strength drops you into an Uber. One bit of advice about Bukowski’s — bring cash, they don’t accept cards. 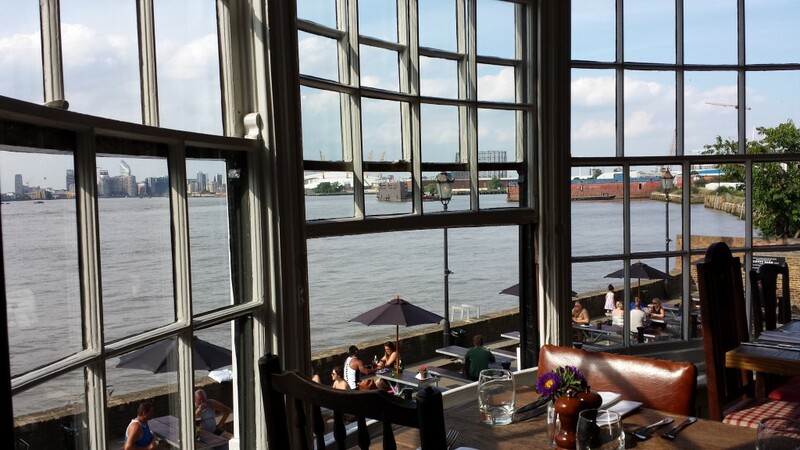 And while you’re there, make time for a nicely presented fresh lobster at the Summer Shack lobster house next door. Sleep it all off in one of the several huge hotels in the area. Tasting Notes: A solid white head rests on a hazy yellow gold foundation; it’s hazy but not clunky and less intimidating than some of the extreme New Englanders. In short, it looks like beer, which is not something you can always count on these days. It has all the punch you’d want and expect from a double IPA, but it’s cleaner and drier than most. It’s dank from the start with heat and metal from the 8% alcohol early, but a quick blast of hops covers the booze effectively. A big finish of citrus includes some tropics before it ends with a long, serious, centered bitter. This is quite the coastal special – a California beer that’s quite at home on the New England coast. Food Pairings: The flavor will hold up to very spicy foods if your palate can take all the excitement. A medium soft flavorful cheese could smooth out the flavors in a final course. Beer Review # 0093 20170329. Dean Lake has worked for a number of breweries in the past couple of decades and he played a role in turning out some of the great beers of the glory years of Tuppers’ Hop Pocket when he was with Old Dominion. He’s landed with full creative control at Leesburg’s Dog Money, which has had as many lives as dean has had jobs. He’s a good brewer whose specialty has been in quality control and we’re looking forward to finding a chance to try a full range of his beers. If you’ve been following these beers of the day you know that we’ve been tasting our fair share of barley wines this winter. Even in the context of pretty strong competition, this one from Dog Money is a winner. In full honesty, Ellie and I didn’t see completely eye to eye on this one. She ranked it in the top third of beers we’ve tasted in the last year, but for me it rose well into the top ten percent. For both of us, though, it made us eager to plan an upcoming trip to Leesburg for more of Dean’s work. Tasting notes: Oh so rich thick and creamy, it shows chocolate, more chocolate and a touch of mint coffee and wine at the end. The chocolate rests on the tongue until you are compelled to return. Some dandelion and stone fruit as it drinks. Ellie found it a bit hot, and there’s certainly booze there. Even I will agree that it’s not the smoothest beer on the planet, but for me the fullness of the body and the richness of the chocolate malt make the return way too easy. Food Pairings: The first barley wines were intended to be replace table wines during a meal, but we think this would overwhelm most main courses. Save it for desert—it’s hard to go wrong with a distinctive local cheese—or just enjoy it on its own as a digestif. 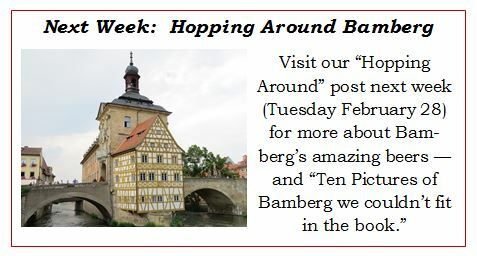 Note: we ran this post in February, but have updated it to include our recent tastings. Heller Brewery’s Schlenkerla beers are among our favorite in almost 40 years of taking beer notes. People laugh when I say the second liter of their Rauchbier Märzen is almost necessary to appreciate the beer. Habituation (the tendency of our senses to screen out constant conditions – like a squeaky air conditioning unit) causes the smoke to recede and the rich clean flavors of the malts to emerge. Smoke at that point is merely a spice rather than the center attraction. 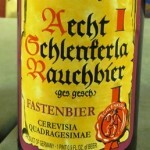 The second liter, therefore, is not only better than the first, it’s one of the very best beers on the planet The Fastenbier – brewed for Lent—might be even better, and it doesn’t take two liters to tell. you’ll have to look in the archives to find this post…. 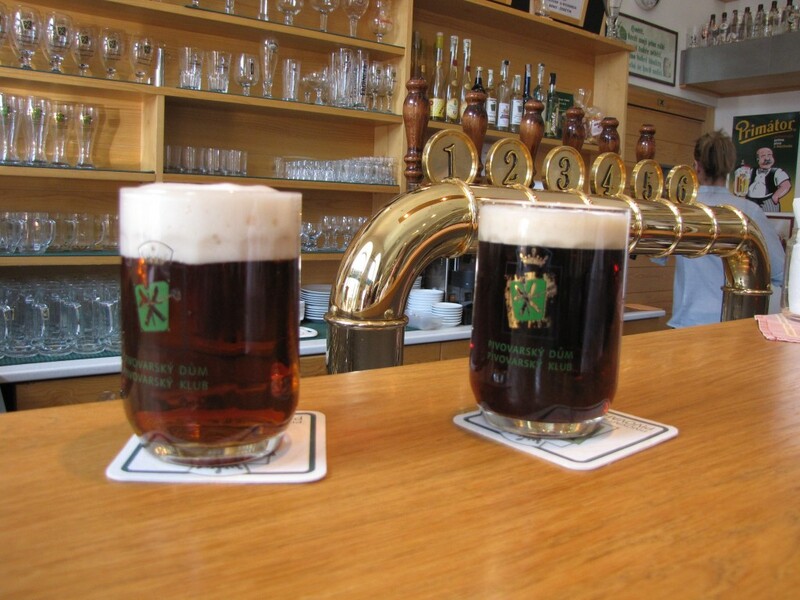 We’re used to savoring Lenten biers from Bavaria, but we’re most accustomed to the “ator” doppelbock range that’s not only common in Germany but almost ubiquitous in the United States. Church policy was “liquida non frangunt ieiunium“—liquid does not break the fast, and we’ve always found these beers have intensified our gratitude to the Creator. Heller’s take on the Lenten beer is more gentle than the Muncheners – it’s just a touch fuller and stronger than ordinary lagers at 5.5% abv. For that, we’re grateful – we can drink more of it. Unlike its year-round cousin, the Fastenbier is brewed from a combination of smoked and non-smoked malt which softens the initial smoke impact. We can’t say at this time whether habituation might actually make the second or third liter less compelling that the Märzen, but we intend to try to find out as soon as we can. Two months of lagering smooths out flavors in any beer and it works wonders here. It’s packaged unfiltered, and a very slight haze lets you know the yeast is still helping to broaden the flavors. Thirty two IBUs are mostly for balance, but they serve well to keep it achingly moreish. We almost never travel to find a specific beer we like – we’ve already tasted it, after all, but we’ve already contacted the distributer (B. United) to find out where we can get it. 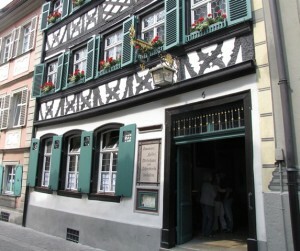 Schlenkera’s Brewery Tap is quaint, but gives little indication of the brewing adventure within. Tasting notes: A reddish-brown color only has a bit of the haze the brewery prepares you for—it’s just about perfect for a bottle conditioning that allows the yeast to favor, but not dominate, the brew. The smoke in the aroma is enormous, but remarkably soft on the palate. The smoke gives it just a hint of oiliness, but creamy and roasty flavors are at the fore. The smoke is more of a condiment than an entrée throughout the tasting. It’s exceptionally rich for a beer of its relatively modest strength. 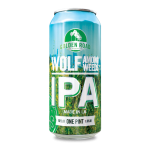 Updated Tasting notes: We bought two cases and two growlers from State Line Liquors in Elkton, Maryland, one of the best beer stores in the United States. We’re pretty sure the beer we tasted had been in the US since last year. 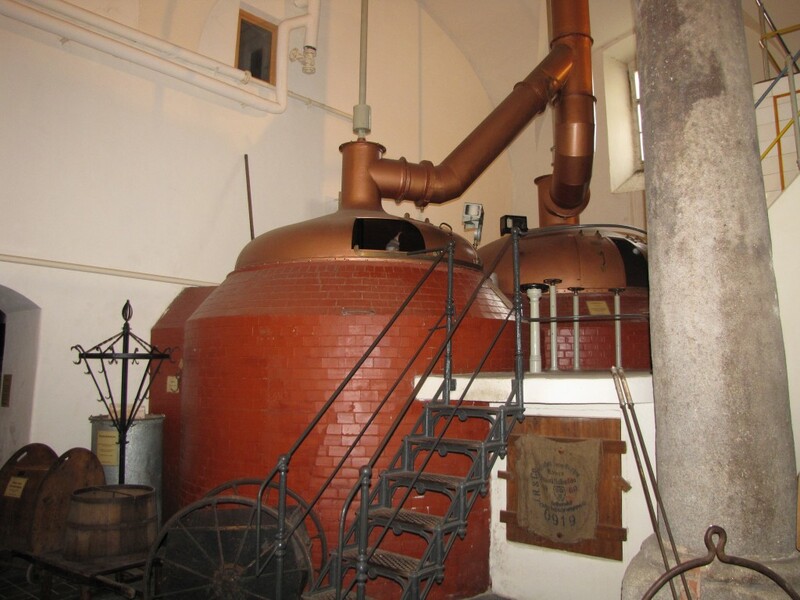 The brewery sets aside some of its production for aging and some claim the beer is better after a year or two. We think the smoke becomes more profound in that time. If you like the smoke, it is significantly better. We thought the brewery fresh version had its own charms, however, and stood apart from the regular Schlenkerla maerzen more distinctly. Still, habituation worked its magic as we cleared through a growler without blinking and wished we had been able to get the entire keg. it wasn’t cheap — at about $100 a case, but one reason I haven’t retired is so we can splurge on beers like this one. TOMORROW WE’LL POST ONE OF THE BEST BEERS WE’VE FOUND IN THE LAST SEVERAL WEEKS. This is the best beer we’ve tasted in 2017.